You need these No Bake Turtle Cookies in your life ASAP. They have all the elements of the classic turtle candies. Gooey caramel, rich chocolate, and pecans. The best part about this recipe is that there is no baking required! I know I have said my Flourless Salted Caramel Cookies are my favorites, but these turtle cookies are high on the list too. They are vegan, gluten free and paleo friendly. Plus, you only need a few simple ingredients to make them! I just had one right before I started this post and they are DELICIOUS! If you don’t have pecans on hand, I believe any other nut should work in their place. The recipe is very versatile. 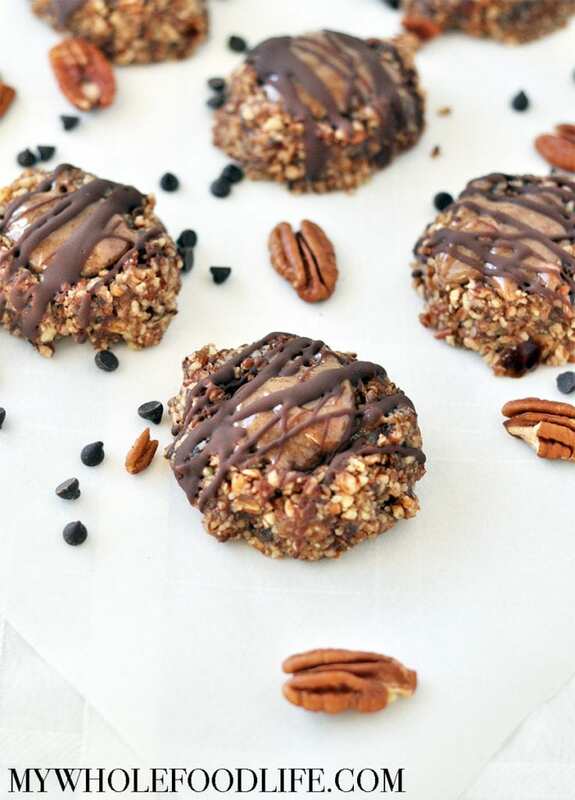 No Bake Turtle Cookies have all the delicious elements of the classic candy, but without the refined sugar, flour or butter! Vegan, gluten free and paleo! In a food processor , add the dates and pecans. Pulse until you get a coarse consistency. Slowly, 1 T at a time, add water until the dough starts to clump together. Roll mixture into balls and place them on a lined baking sheet . Flatten each one with your palm, and then use your thumb to make an indentation in the middle of each cookie. Place them in the fridge. While you make the caramel. To make the caramel, mix the almond butter and maple syrup in a small blender . Spoon a little caramel into each cookie and place them back in the fridge while you make the chocolate. To make the chocolate, use a double boiler method to mix the chocolate chips and coconut oil. Once melted, drizzle a little chocolate over each cookie until they are all covered. Place back in the fridge to set. Please tell me what kind of a blender will accommodate 6 Tablespoons of something. I can't see my Blendtec doing anything with such a small amount. Is there an error in the recipe? I have a blendtec and use the twister jar attachment on it. It's a much smaller canister. There is no error in the recipe. You can try mixing by hand too. This is such a fun idea! I would honestly never have thought of this, but I bet my kids would just love it! Thanks! I hope they enjoy them!